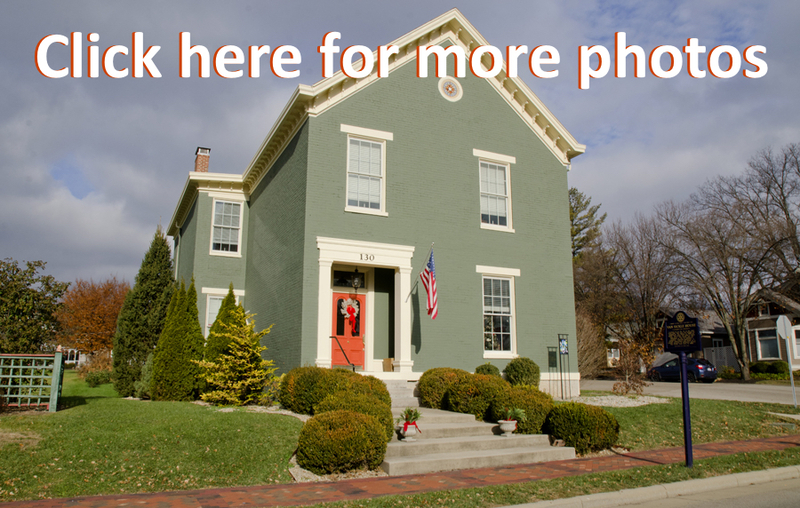 LEBANON, Ohio -- If you were to visit the historic Lebanon home of renowned illustrator Chris Payne, wouldn't you expect to see several of his portraits of famous people on the walls? 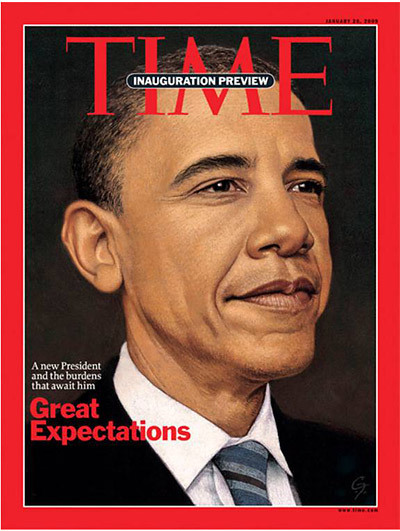 Perhaps the one of Barack Obama that Time magazine commissioned for its cover six days after he became president on Jan. 20, 2009? We did, but boy, were we wrong. In fact, more surface area in the Paynes' house is covered with quilts crafted by his wife, Paula, than illustrations signed "C.F. Payne." There are two reasons for that, Chris explained. For one, he is rarely completely satisfied with his work, and having to stare at it all the time, to see where an improvement was possible, would be distracting and frustrating. "It's like a scab. It'll never get well," he said. Then there's the inspiration he draws from the works of other artists -- people he admires and most of whom he knows -- that do hang in the house. Particularly inspiring is the gallery of 50 illustrations displayed in Chris' vaulted, second-floor studio. It includes pieces by two fellow Cincinnatians, cartoonist Jim Borgman and Heart Mini Marathon poster artist Dave Maggard. "It's fun having their work up," Chris said. "Most of the artists whose art I have up (also) own a piece of mine." The Paynes have lived almost three years in the 1883 Italianate home built for Lebanon grocer and city councilman William H. Van Sickle. The couple, both Miami University graduates, met on a field trip bus when she was a Princeton High School junior and he was a Wyoming High School sophomore. They married in 1980. They chose to display most of their unique artwork -- which includes several of Philip Burke’s wonky caricature portraits, illustrations and photographs of family and famous sports figures -- in his studio, the appropriately named Bobblehead Room (most of the figures that crowd the mantel are Cincinnati Reds) and in their upstairs hallway/reading room. The piece of art visitors likely see first when they enter the Paynes' home looms large above the landing of their beloved, low-railed, white-spindled staircase: a framed illustration of Santa Claus, drawn by an unknown artist in the style of Haddon Sundblom, the creator of Coca-Cola's iconic 1930 images of the big elf. It is one of two Santa images that hangs year-round in the 3,200-square-foot, four-bedroom, two-bathroom house. A historical sign about Van Sickle erected by the city of Lebanon fronts the house, which until this year was painted white. The new green paint job is one of many improvements the Paynes have made since they bought the house in March 2014. They thought they were going to get a ranch-style home for single-family living. Warren County was an obvious choice. The couple, who had lived in Wyoming for eight years and Evendale for 17 years, wanted to stay near their two adult sons and be closer to Columbus, where Chris taught illustration at the Columbus College of Art and Design several times a week. But, Paula said, they didn't find a place they liked, so she started looking at historical homes, focusing first on one two doors west of the Van Sickle House. It was more of a project than the one they bought. "This one was not great, but it was in better shape," she said. "I think what sold us on it was the staircase," Chris said. That's right, Paula said. "We saw the stairs, and we were done." As they dug into the house's bones and its history, the couple learned about its many lives. Walls to the 12-foot ceilings had been added, and a back-of-the house staircase and a fireplace in the downstairs bedroom -- now the Bobblehead Room -- had been closed off. Mantels had been shuffled, and chandeliers and ceiling medallions had been replaced. The couple made changes required to turn the house back into what it was built to be: a single-family home. "We didn't know what, if anything, was original," said Paula, a retired hospice nurse who researched public records to learn what she could about the home's past. "I wish I could tell you what was here before, but I have no idea. ... The kitchen upstairs (now Chris' studio) looked like a teenager had put it together, and there were walls that closed off space for law office cubicles." One improvement they couldn't make, Paula said, was to spruce up the extra-long pine floorboards in each of the first level’s four main rooms and entry hall. "The floors were not in good shape," Paula said. "They were poorly varnished, and we were told they couldn't be refinished because they're so thin. But that doesn't bother me. I like them. If you look closely you can see where high heels have been on it. They are what they are, 130 years old," Paula said. "It's like an old coin," Chris said. "If you polish it, if you clean it, you take away its character." During remodeling, the Paynes' construction crew tore down walls that had portioned off spaces when it was an apartment building, art gallery and law office. They gutted a 16-foot by 13-foot room in the back of the house and installed a modern kitchen with white cabinets, gray Carrara marble tops and stainless-steel Bosch appliances. The couple also remodeled the first-floor bathroom, adding a shower and new sink. The living and dining rooms, which both measure 16 by 17 feet and feature wood fireplaces that could be original, required cosmetic repair and are furnished with numerous pieces of new Stickley furniture purchased at Verbarg's in Kenwood. Upstairs, the Paynes turned the former kitchen into Chris’ studio with minimal effort. It features exposed brick walls on two sides of the vaulted ceiling, two portal windows and an antique stained-glass window that oddly faces into the attic. They replaced a deck off the studio with a smaller one that's perfect for morning coffee or an evening beer, Chris said. A second bedroom with large windows that look out over the front of the house became Paula's sewing and knitting room. The couple added much-needed storage closets there -- the 1883 house was built without them. The Paynes also gutted their upstairs bathroom, added a walk-in shower, a double vanity and a washer and dryer, and put in library shelves in an open reading room at the top of the stairs. The fourth room upstairs is a guest bedroom. This year, the Paynes completed what could be their last major home improvement project: the addition of a two-car garage between the house and a business next door. Although Chris doesn’t drive to Columbus anymore (he now directs, most often remotely, the Hartford School of Arts’ illustration master’s program), not having to scrape snow off his car is a luxury he never takes for granted.